As a pet owner, you must be familiar with vets and their veterinarian clinics. However, vet hospitals are very different from veterinary clinics. Vet hospitals are generally much more prepped and equipped to deal with emergent situations pertaining to your pets. So, in a regular situation under a controlled setting, you may opt to visit a veterinarian clinic. However, a vet hospital becomes a preferred choice under unforeseen and sensitive situations where immediate attention is needed. At a typical vet hospital, pet emergencies are taken much more seriously with a sense of urgency. They are prepped beforehand to deal with the demanding situation. They strive to be well-equipped with materials, instruments, and staff to better fulfill the needs of the situation. This post is aimed at creating more awareness about veterinary hospitals and their services. Having this facility saves lives to a great extent. A vet hospital houses a professional fleet of veterinary surgeons that work round the clock and are experts at it. Summer Hill Village Vet will be well-suited to meet such emergencies. Veterinary clinics get a limited time to function. However, hospitals are bound by no such timelines. They function 24×7, providing stellar medical facilities to all pets and breeds alike. Vet clinics have their set hours where they consult and create a diagnosis. As a pet parent, it is your responsibility to be aware of all the veterinary services around you. Emergencies come unannounced and all you can do is be best prepared for them. You should check with your local vet hospitals and clinic to know exactly which service is offered where. It is always advisable to keep your preparation strong, so at times of emergencies, you don’t fret. ADVOCATE 25% Off Parasite Protection! From September the 3rd 2018, we are offering 25% off ALL Advocate 6-pack products purchased from our clinic. So now is a better time than any to brush up on your pet’s flea, tick and worm protection. Prevention is always better (and cheaper!) than treatment especially when it comes to parasites. 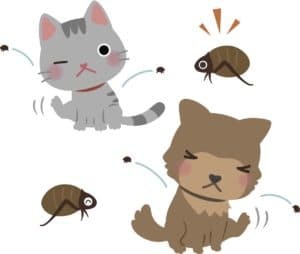 Take for example a simple flea infestation- fleas can easily transmit worms to your pet which can then snowball into a range of serious health issues. As an inner-west veterinary clinic we find that a lot of pet owners have the common misconception that they don’t need to worry about parasite control because of the urban environment. Your dog or cat can easily get fleas whilst they are out on walks, visiting the park or from coming into contact with other animals. appropriate for your furry friend. 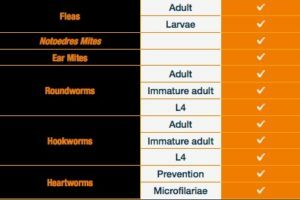 The type of parasite protection your pet needs depends on a lot of factors- living conditions, holiday trips, contact with other animals, method of dispensing (oral vs topical) and etc. Our vets are more than happy to have a chat with you and help you find out what kind of coverage best suits your pet’s lifestyle. How will my pet and I benefit from the 25% off Advocate promo? The promotion we are running is only for the Advocate Topical parasite treatment when purchased in a 6-pack. 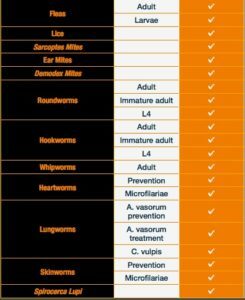 The tables below show the range of parasites covered by Advocate Spot-On in cats and dogs. After discussing your pet’s situation with your vet you can decide based on the below charts whether Advocate is the best choice for your cat or dog. https://summerhillvillagevet.com/wp-content/uploads/2018/08/advocate-fb-cover-photo-1.jpg 300 720 sumHill https://summerhillvillagevet.com/wp-content/uploads/2017/02/summer-hill-village-vet-logo-phonectr-2.gif sumHill2018-09-11 23:14:522018-11-29 04:12:56ADVOCATE 25% Off Parasite Protection!